Frank Barson, the great England and Aston Villa defender, once said. “Give me a good centre-half and I will give you a good team”. The truth of these words can be found in the list of great central defenders who have graced the Maltese game. The names of ‘Balolu’ Busuttil, C.F. Huggins and Gejtu Psaila are on top of the list but others like Archie Caunter, Josie Fearne and Kelinu Azzopardi were worthy successors. In our era, the local game also boasted fine centre-halves. I remember with nostalgia Joe Cilia, of Valletta, and Louis Theobald, of Hibernians, among others. Azzopardi was born in 1904 in Valletta. He started his career as an inside forward with Valletta United in 1925-26. In 1929, he joined Ħamrun Spartans. In those days Ħamrun had a problem in central defence and Azzopardi was tried in that position. He was an instant success and the next season he was back with Valletta leading the team to the league title in 1931-32. During that season Valletta met the Worcestershire Regiment in the semi-final of the Cassar Cup. This tempestuous match went down as the only match in the history of the Cassar Cup to be abandoned. The Worcesters were leading 1-0 when they were awarded a penalty. ‘Gejta’ Azzopardi stopped the shot but could not hold it, the ball rebounded to Archer who promptly netted. It was a perfectly legitimate goal but few people understood the rules in those days and when the referee gave the goal he was surrounded by angry Valletta players. The chief culprits were Micallef and Kelinu Azzopardi who created such a fuss that the referee ordered them both off the field. Azzopardi refused to leave and the referee had no option but to abandon the match. Azzopardi’s action led to his suspension from the game for a season and to the disbandment of Valletta United. While the crowd was still leaving the ground, the Cassar Cup committee held an urgent meeting there and then and decided to replay the match immediately! A new referee was found and Valletta were ordered to take the field without Kelinu Azzopardi. The Worcesters sportingly accepted this bizarre decision and the match was re-started. In the meantime, Pawlu Friggieri and Abela, of Valletta, had already left the ground. Baskal Scicluna, who happened to be watching the match, was drafted in and Valletta took the field with only nine men. This handicap was too great for the City team and the Worcesters won the ‘replay’ 3-0. Valletta goalkeeper ‘Gejta’ Azzo­pardi was the hero of the match, bringing off save after save and had it not been for him the score would have been in double figures. To complete the story one must add that the Worcesters went on to win the cup after beating Sliema Wanderers 3-2 in the final. When his suspension was over, Kelinu Azzopardi joined Sliema Wanderers. This was the start of one of the greatest eras in the history of the club. Five great seasons in which Azzopardi helped Sliema to win three league championships, three cup finals and two Cassar Cup finals. Azzopardi was definitely the best centre-half around at the time. He served his civilian clubs faithfully but it was with the Royal Malta Artillery that he played his best football. The RMA did not carry off any prizes in those days. They were twice forced into the runner-up position in the Army League by the all-conquering Worcestershire, but theirs was a fine team indeed. 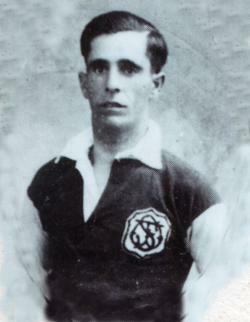 The influx of foreign players in the late 1930s forced Azzopardi to temporally give up his place in the Wanderers’ team. Kaburek, Freiberger, Lowinger and Ivica Gayer were all tried in the centre-half position but none fitted the bill better than Azzopardi and each time the Blues had to fall back on their old stalwart. After a couple of seasons with Valletta City he rejoined the Wanderers, winning yet another league and cup double. During the war he featured for Sliema Wanderers, then playing under the name of Sliema Athletics, in the Christmas Cup and Victory Cup. At the end of the war he retired, leaving a void in the Sliema ranks which was only filled successfully when they signed Eddie Cole from Melita FC. Kelinu Azzopardi died on September 7, 1974.